With it's aggressive gaming design, the Kolink Aviator is an excellent example of a gaming case that is packed full of features without the hefty pricetag. For over 15 years Counterstrike has been at the heart of the first person shooter scene. A favourite of LAN events and online gaming, driven by it's simple, fun, addictive gameplay and accessible learning curve. Counterstrike has gone from strength to strength since the launch of it's fourth incarnation, Counterstrike: Global Offensive, or CS:GO, thanks to a global competitive gaming tournaments and the growth of the pro gaming scene. A favourite of YouTube and Twitch streamers alike, CS:GO is easy to pick up but requires dedication to master. If you, one day, want to be a Global Elite ranked Countrstrike player Overclockers UK have developed a system designed to offer a super high FPS, maxed out quality gaming experience. With the Titan Global Elite, the only thing holding you back is your skill (& your team mates). 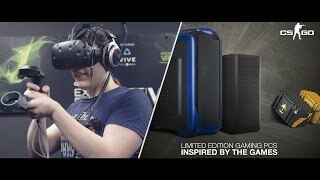 More links for "Titan Global Elite - Gaming PC For CS:GO - Intel Core i5 7400, GTX 1060 3GB"